Wind and rhythm section at the 2012 Collaboration Concert - sorry to miss out the fiddles!! These are music recordings from a regular Greenshoots session at the Black Horse at Melbourn. They were recorded by Mike Rawlings. There is some background noise from the bar at the pub. Curly Headed set - Three tunes - Curly Headed Ploughboy, Harper's Frolic, and Bonnie Kate. We were practicing transitions between tunes, and this second week recording shows some success! Three Sea Captains - showing that we keep playing a tune several times to try and improve! 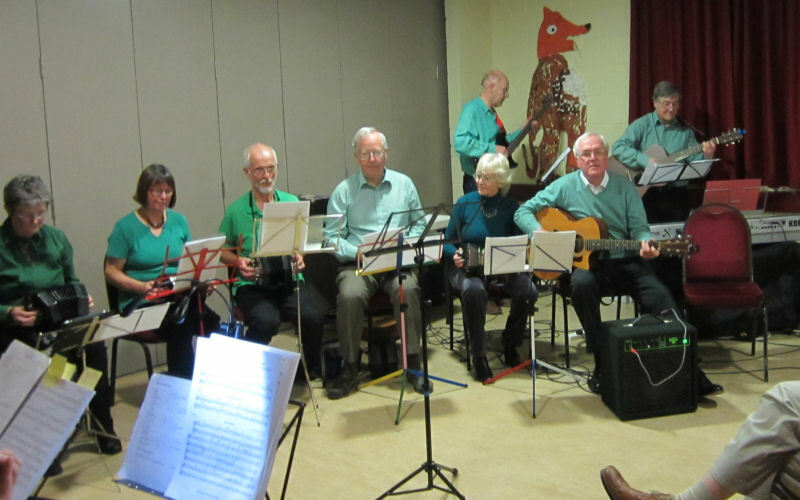 These are music recordings from a regular Greenshoots session at the Black Horse at Melbourn. They were recorded by Mike Rawlings - without telling anyone, so we are in normal playing mode rather than performing! Manchester & Sheffield Hornpipe - a pair of traditional hornpipes. Old Kiss my Lady - and old English dance from Shropshire. The Long Room of Scarborough - a slip jig in 9/8. Musical Priest - an Irish reel. Music recordings from Greenshoots performance at a local 'collaboration concert', held in Whittlesford, near Cambridge, in October 2011. They were recorded on a Zoom H2 digital recorder and processed using Audacity, both by Paul Hardy. Fakenham Fair - a traditional English tune from East Anglia. Bonny Kate - a traditional tune that has travelled around the British Isles, probably starting in Scotland, and then becoming common in Ireland before returning to England. Probably played a lot in 2011 because of a royal wedding! Harper's Frolic - a traditional Irish tune. Archibald McDonald of Keppoch - a Scottish lament for the chief of the McDonald clan who died in 1682. Rights of man - a traditional Irish tune. Bluebell Polka - a traditional Scottish dance tune. Complete set - minimally edited complete set (for us players to critique!). Music recordings from Greenshoots performance at a local 'collaboration concert', held in Whittlesford, near Cambridge, in October 2012. They were recorded on a Zoom H2 digital recorder and processed using Audacity, both by Paul Hardy. Complete set - minimally edited complete set. Tunes are Ballydesmond polkas 1 and 2, Gentle Maiden (in 2 parts), Sececa Square Dance/Waiting for the Federals, Lios na Banriona (in 2 parts), Mrs Saggs, and Shove the Pigs Foot a Little Closer to the Fire.